I recently received some beautiful wax melts from the Blue Dog Company, and I am now struggling to put into words just how wonderful these melts are! This is when I need some futurist scratch and sniff screen for you! Who is Blue Dog Company? 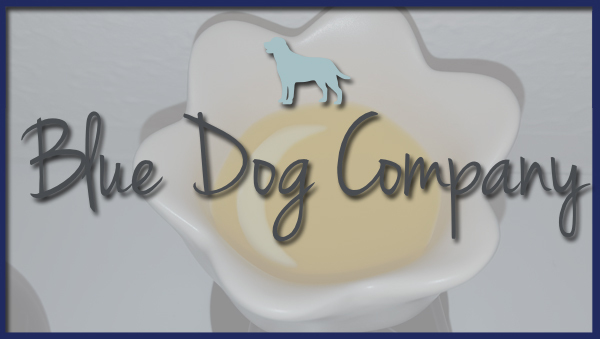 The Blue Dog company are a husband and wife team based in Salisbury who has sourced and handmade some amazing wax melts! These melts work like candles without a wick. 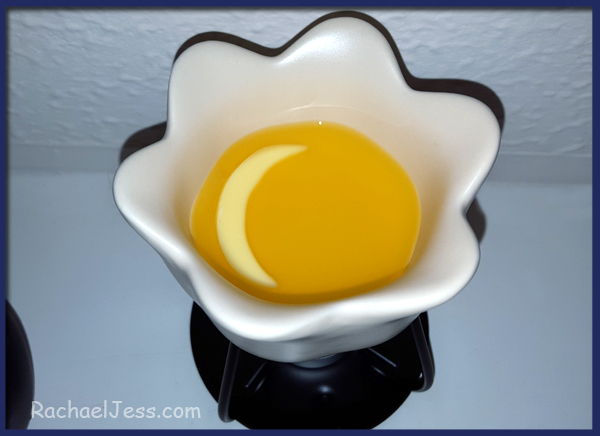 The melt is placed on top of a wax warmer and an unscented tea light is placed underneath and melts the wax - the fragrance these wax melts give off is amazing! Unlike other companies who use cheaper paraffin wax, Blue Dog Company only use 100% natural soy wax, which is renewable, sustainable and biodegradable. There are currently 12 magnificent scents to choose from, each costing £1.19 - an absolute bargain! Once you have purchased your wax melts, these will be sent out in a beautiful box and a personalised note from Paul & Affi, after all, the company is very much about the personal touch! 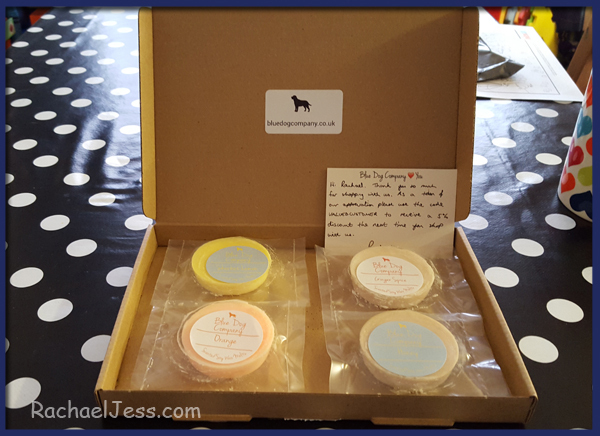 So, as I mentioned at the start I received 4 of these magnificent wax melts to review - and I'm so glad I did! 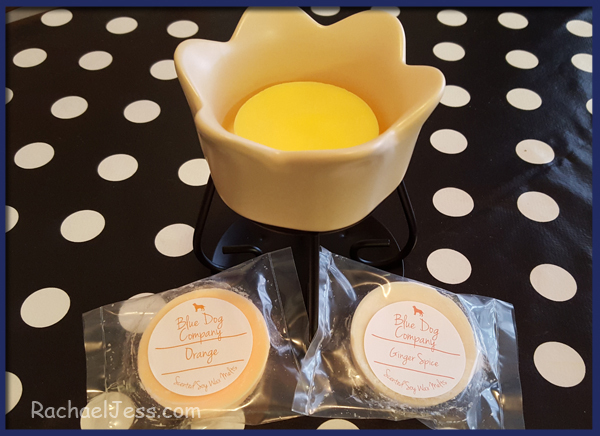 The scents I chose were Honey, Lemon Sherbert, Ginger Spice and Orange (nice warm winter fragrances) and you can smell the aroma coming out of the box when it arrives! It's rather exciting really! I set up the wax burner with the Lemon Sherbert and within 15 minutes the wax had melted and the room was being filled the distinct smell of Lemon Sherbert. It really is rather impressive how quickly the scent drifts through the house. I can't really do the wax melts justice in a post or even a video! To totally appreciate the wonderful smell these delicate handmade wax melts give off you'd have to come round. Obviously, that's not going to happen so I can offer the next best thing, a chance for you to win your own set of 4 melts - I promise you, you will not be disappointed! Disclaimer: I received these wax melts from The Blue Dog Company to review. I wish you could smell them through the computer screen! I think the coconut one would be my favourite! Fig and Cassis, I love anything fruity! Fig and Cassis scent sounds lovely! Sherbet lemon sounds like it would smell amazing! Fresh Linen is my favourite scent from their selection. The Coconut scent sounds nice, so many to choose from.